Yesterday was a long, strange, time-warp kind of day and I am so happy to be here today. The highlight was when I walked to the post office to find two yellow slips in my p.o. box. And you know what that means? Packages! Yay! 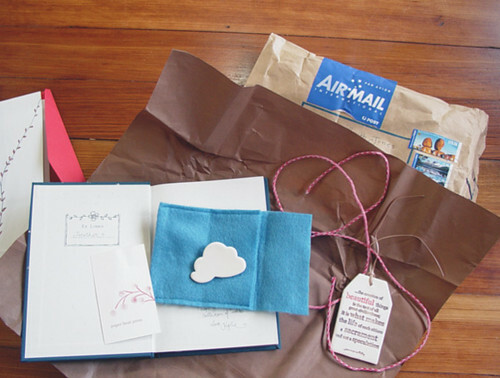 Sweet Kylie of paper boat press sent me a collection of things she makes, all the way from Australia. Kylie is multi-talented, making prints, ceramic art and writing poetry. She included her book of poetry "count me the stars", which I enjoyed getting lost in this morning. And of course, I'm smitten with her cloud pin. The whole package was filled with goodness. Every single item is meaningful. Kylie is also part of the Umbrella Collective, which "are six women artists brought together by the love of craft and the bond of friendship." 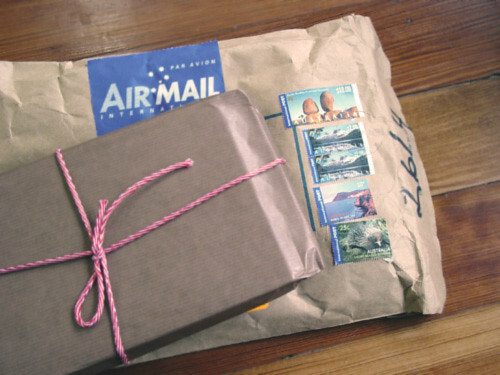 There was also a lovely puffy parcel from Shanna : two trees. 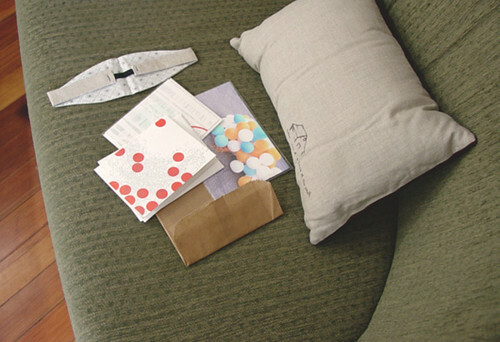 Shanna sent one of her lovely pillows that has found a happy home on the loveseat in my studio. It's her 'barn pillow' which says 'take care of a piece of the earth'. It's sooooo nice. I also got a preview of two of her brand new collaborative letterpress pieces with Pistachio Press. Let me tell you, they are beautiful! And look at the balloon print! It makes me happy. And lastly, a lovely head band. I was showing my husband all these goodies and he said "I think that's one of those things you cover your eyes with when you sleep". I said "no, I think it's a head band." hee hee. Men. Every little thing sent by these two super talented women was a treat, down to the string, paper, and especially the hand-written notes. I really feel spoiled by these friends. Thank you Kylie & Shanna! You made my drab day sparkle sparkle sparkle! I hope your day has moments that glisten today.